Kosovo and Metohia are like a cathedral shrine to the Serbian people. Byzantine sources confirm that colonisation of the Central Balkan region by Slav tribes was completed during the 7th century. Gromile - Serbian tumulus - kenotaphions from the 7th-9th century, dating back to the pre-Christian era, were found in the vicinity of Ravna gora, on the Mount of Ostrovice, between Prizren and Strbac. During the mid-10th century and under the Byzantine emperor Constantine VII the Porphyrogenitus (610-641) the Serbs settled in the province of Dalmatia. (Constantine Porphyrogenitus De administrando imperio, Ed Gy. Moravcsik, English translation by R. J. H. Jenkins, Budapest 1949. cap. 32). The 11th-12th century Constantinople acknowledged that the border of Dalmatia, inhabited by "Dalmati" i. e. Serbs, started from Kosovo. (Anne Comnene, Alexiade-Regne de l'Empereur Alexis I Comnene 1081-1118; texte etabli et traduit par B. Leib, Paris 1937-1945, II, 147-148, 157, 166, 184). 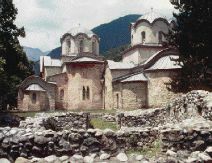 Archeological finds verify the uninterrupted presence of the Serbs in Kosovo and Metohia since the early Byzantine period, that is the 6th century. 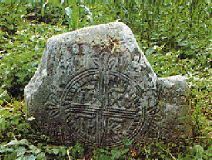 The oldest of such finds are tombstones--gromile on the mount Ostrvice, south-east of Prizren, from the times when the Serbs used to cremate their dead. The gromile are succeeded by the 9th-11th century cemeteries in which jewellery, characteristic of the Slavs from the region between Moravska and Macedonia and bearing Serb ethnic quality, was found: Cecan, Maticane, Badovac and Gracanica. Particularly important are the Serb cemeteries dating back to the 11th-13th century in Vrbnica near Prizren, Prcevo near Klina and Vlastica near Gnjilane because they speak of the permanent presence that can be followed up through the 14th-15th century tomb stones. 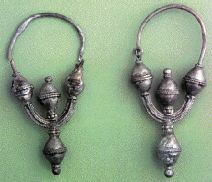 Maticane-earings, characteristic of the 9th-11th century Serbs, ascertaining that the center of their production was on the territory of Kosovo and Metohia (Cecan), in Serbia. The Raska Diocese (eparchy) is first mentioned in the II chrysobull of the Byzantine emperor Basil II (976-1025), from the year 1020. It was, at the time, part of the Ohrid Archdiocese and it encompassed the Serbian territory around the rivers Raska, Ibar and Lim. 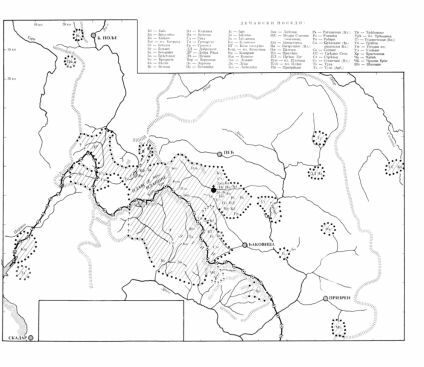 In 1219, under Archbishop Sava, it became part of the autocephalous Archdiocese of Zica. With the establishment of the Patriarchate of Pec, 1346, it was raised to the status of the Metropolinate. Patriarchate of Pec Monastery. A complex of four churches built by the Nemanjici between 1230 and 1330 on the foundations of centuries old bishopric centre. The Prizren Diocese is mentioned in 1019, in a chrysobull of the Byzantine emperor Basil II. The Diocese included the town of Prizren with the surroundings, Hvosno (the part around Decani and Pec) and the area around the rivers Beli and Crni Drim. 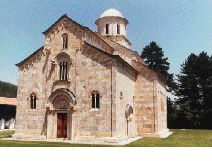 It became part of the independent Serbian Archdiocese in 1219. The Hvosno region came under special Hvosno diocese with the seat in the Monastery of Mala Studenica, north-east of Pec. With the Serb Orthodox Church being elevated to the level of the Patriarchate, the Prizren Diocese acquired the status of a Metropolitanate. The old Hvosno and Lipljanska dioceses, i. e. that of Gracanica (Novo brdo), were added to the Prizren Diocese after 1766. The Patriarchate of Pec was established at the end of the 13th century when the seat of the Serbian Church was moved from Zica to Pec. It was abolished in 1766 and joined with the Prizren and Skenderia dioceses, and later with the Raska Diocese. After the old Serbia was liberated from the Turks, in 1912, the Pec Diocese was re-established. In 1808 the Prizren Diocese was joined with the Diocese of Raska thus forming the Raska and Prizren Diocese, which has been in existence as such ever since. Its seat is in Prizren. The shrines from the Raska and Prizren Diocese have always been a prey to various invaders and enemies of the Serbian people. Desecration and destruction began with the Turks and continued with Albanians (Shqiptars). A number of churches were converted into mosques. The old Christian sites served as the base for Muslim places of worship. Material from the original Serbian shrines was used for building mosques. At the beginning of the 17th century Sinan-pasha of Prizren built a huge mosque in this town using the material from the destroyed monastery of the Holy Archangel, the foundation of Tsar Dusan. 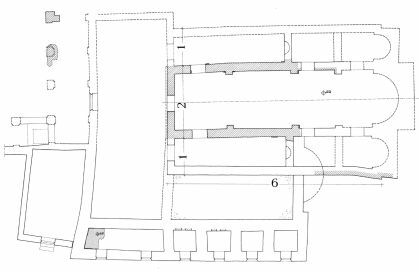 In 1688 the Turkish Yegen-pasha looted Gracanica Monastery needing nine horses to take all the valuables to Constantinople. During the First (1914-1918) and the Second (1941-1945) World War Serbia's oldest holy site was looted and shelled by Germans, Italians and Albanians. After the Second World War local Albanians continued to plunder while the communist regime nationalized property of the monasteries. The Raska and Prizren Diocese has been the guardian of Serbia's spiritual heritage, accumulated over the centuries, from the days before St Sava onwards. 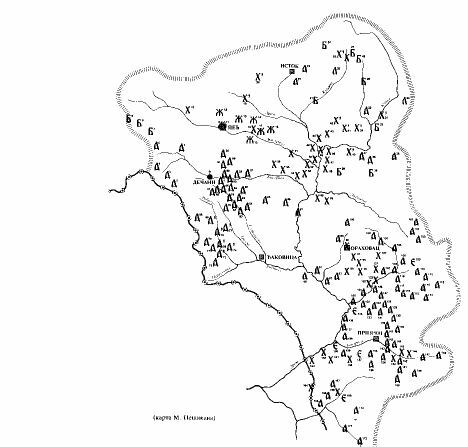 An official census of Kosovo and Metohia lists 1446 towns and villages. According to the 19th and the 20th century research 162 sites from this region were declared cultural heritage of extreme importance while 500 others were classified as cultural monuments and over 1400 were listed as cultural heritage of importance to Serbian people in this country. The most cultured of all Serbian lands achieved its peak during the 13th and 14th century, and also enjoyed some days of glory in the 15th century. A testimony to this are beautiful shrines, Serbian prayers in stone: Visoki Decani (1327-1335), the Patriarchate of Pec (1230-1330), Our Lady of Ljevis (1219), Gracanica (1313-1321), as well as the remarkable ruins of St Peter of Korisa, Hvostan Studenica, the Holy Archangels, Banjska, Zvecani, Novo Brdo, Prilepac, Obo`ac, Ajnovac and a score of noblemen's endowments from the 13th and 14th century. These are not the only valuables. There were hundreds of smaller churches, monastic sanctuaries, hermitages, hillforts in the fields next to river springs or roads. 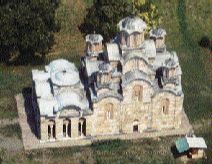 Churches of the Kosovo-Metohia architectural group have characteristic ground plan in the form of an "inscribed cross", roofed with a dome. The walls were usually built with alternate rows of dressed stone and bricks. The Patriarchate of Pec, consisting of four churches and a spacious narthex, shows the influence of two schools: the 13th century Raska school (the Church of the Holy Apostles) and the Kosovo-Metohia school (the Church of St Demetrius and the Holy Virgin). Decani represents a combination of multi-nave basilica with a dome in the Romanesque and partially the Gothic style since the master builder was a Roman Catholic monk Vita from Kotor. The Romanesque bell-tower of Bogorodica Ljeviska mirrors the western influence. The Saxon church in Stari trg, built in the 13th century as a cathedral church for the well known German miners working in medieval Serbia, shows remarkable blending of the Byzantine and Gothic art. Serbian monumental wall painting from the pre Nemanjic days, developed at the end of the 12th century, has been preserved, among other places, on the walls of a cave parecclesion (chapel) of Peter of Korisa near Prizren. The 13th century master wall painters produced mature works. Having created a new style they also introduced certain innovations: the blue colour was replaced with golden, still figures were painted in thick brush strokes, the rich colouring was effectively pronounced with the playful use of light and shadows. Figures showing plastic shapes date from 1250 and are characteristic of the Church of the Holy Apostles in the Patriarchate of Pec. These features were noticeable until the second decade of the 14th century the example of which can be seen in the Monastery of Banjska (1313-1317) where frescoes show "golden sky" instead of blue background. For the first time in the iconography of the Christian East there were representations from the Cycle of the Apostles and the Book of Genesis. The scenes became more lively and deeper, figures showed movements, colours were richer, shapes more plastic. Artists' imagination found its full expression. The expansion of themes caused the picture format, together with the size of the scenes and figures, to become smaller. Fresco figures were often lined up in ten and more zones. A special, so-called Milutin court art school was founded. The 13th and 14th century fresco painting of Kosovo and Metohia occupies a special place in the art of that period. The fresco painters, such as the temperamental colourist Mihailo Astrapa (the Holy Apostles in the Patriachate in Pec, Bogorodica Ljeviska....), and some unknown fresco masters from Decani and Gracanica rank among the best artists of that period in the world. Significant achievements were attained in two fresco schools: the Pec-Decani school and the Prizren school, both equally successful in producing expressive miniature art. 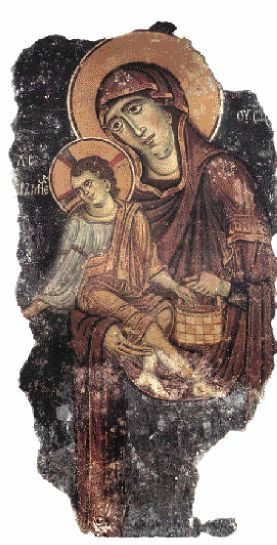 Famous, as well as unknown, artists from those fresco schools and scriptoriums created some remarkable works of art among which are two Prizren icons from the first decades of the 15th century: Our Lady Hodegetria and Our Lady Umiljenija (originally part of the Bogorodica Ljeviska iconostasis). The five Decani icons, painted by the same zographer's hand that made the outstanding frescoes in the Decani churches, have stood the test of time for more than five centuries. Among them shines the icon of Our Lady Pelagonitisa. A rich 14th-17th century icon collection helped establish artists such as the monk-zographer Longin from Pec, the painter Radul, Maksim Tujkovic, unknown illuminators of handwritten church book, as well as painters working on canvas. The treasuries of Decani, Gracanica and the Patriarchate of Pec contain over 300 handwritten and printed books spanning the period between the 12th and the 18th century. There are also 109 icons and over 100 liturgical utensils made of metal and textile. Other, smaller churches also posses a considerable number of icons and other movable valuables. There was a printing shop at Gracanica Monastery in the 15th century. The Gracanica Octoechos was printed there at the beginning of 1539. Cultural and artistic treasure of Kosovo and Metohia ranks among the greatest achievements of Christian civilization. Hierarchs, monarchs, monks and clergy together with people built and decorated churches, monasteries and cave hermitages. Many of such pearls of the medieval architecture stood the test of time and have been preserved until the present day. © Copyright 1999-2000 kosovo.net / Voice of Kosovo and Metohia. All rights reserved.